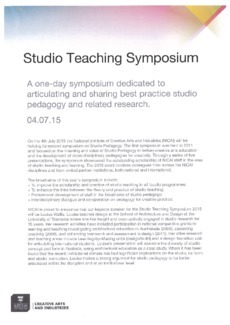 On the 4th July 2015 the National Institute of Creative Arts and Industries (NICAI) will be holding its second symposium on Studio Pedagogy. The first symposium was held in 2011 and focused on the meaning and value of Studio Pedagogy in tertiary creative arts education and the development of cross-disciplinary pedagogies for creativity. Through a series of live presentations, the symposium showcased the outstanding scholarship of NICAI staff in the area of studio teaching and learning. The 2015 event involves colleagues from across the NICAI disciplines and from invited partner institutions, both national and international.